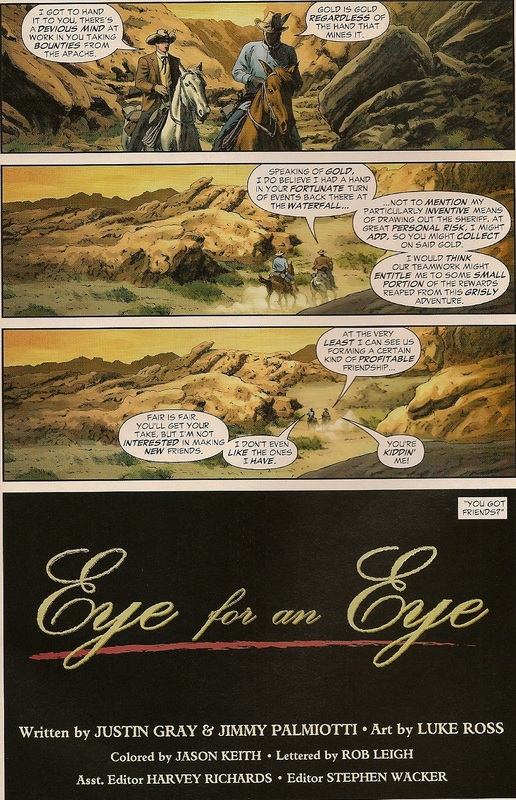 Matching Dragoons: Jonah Hex V2 #3 "Eye for an Eye"
Jonah Hex V2 #3 "Eye for an Eye"
Jonah Hex comes across several wagons of settlers that have been slaughtered by Indians and examines the arrows and the footprints. Jonah tells them that the Indians are about thirty minutes away and two of the gunmen start to panic. The store owner says that the Apache are coming for revenge, to kill these men who have been committing murder dressed as Apache. Jonah pulls his pistol and shoots the three men dead. Hex asks the post owner if he would testify that these men were murderers and the owner replies that he would. He then asks Hex what can they do about the Apache war party? 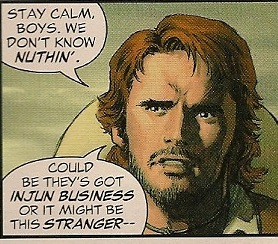 Jonah calmly says that there ain't no Apache war party. Later that night, during a downpour, Hex and the store owner roll into the town of Kent. The sheriff, who is getting a shave, is called out by a local to see Hex dragging the three corpses behind his horse. The sheriff looks at the dead ringleader and whispers "Nate". The sheriff then pulls a pistol on Hex but the store owner starts to tell the story of what happened. The sheriff arrests Hex but the owner says "You don't know these men" to which the sheriff reveals that the ringleader is his kid brother. Later Hex is in the jail cell asking what became of the store owner. The sheriff explains that he reasoned with the man and his distance and silence would be insured. Hex then asks what is to become of him. The sheriff tells his goons to do their best. Much later, the two goons are on a raft if the river with a large box on it. They wonder out loud how much longer they and the sheriff can keep up the Indian masquerade. They slip the box into the water, commenting on how Hex wasn't that tough after all. One goon says that he would prefer to hang Hex, the other replies that maybe Hex will wash ashore and someone can have Hex stuffed. The box, with Hex inside, floats down the river and starts slowly leaking. Jonah struggles with the ropes around his wrists but is helpless as the box floats on and hurls over a waterfall, smashing to bits on the rocks. Hex manages to barely swim to shore and passes out. A man rides up with a lantern and asks Hex if he tumbles over waterfalls for his own amusement or is there a paying audience hidden in the darkness? The man cuts Hex free and asks his name. Jonah tells him and the man introduces himself as Bartholomew Aloysius Lash, gambler by trade, womanizer by design and outlaw by tragic error (the best introduction ever written...ever! Doubt me and I'll fight you and WIN!). Hex said that he's never heard of Bat Lash and Bat is very happy, considering Hex's trade. Hex asks what Lash's business is and Bat confides that he is heading into Kent. Seems that earlier in the day Bat came across a dying girl that had been raped by by white men posing as Indians looting wagon trains. Jonah confides that he had a run-in with those men and they ended up dead, however, the brother is still alive and was backing the whole plan. Lash and Hex hatch a plan and head into town. 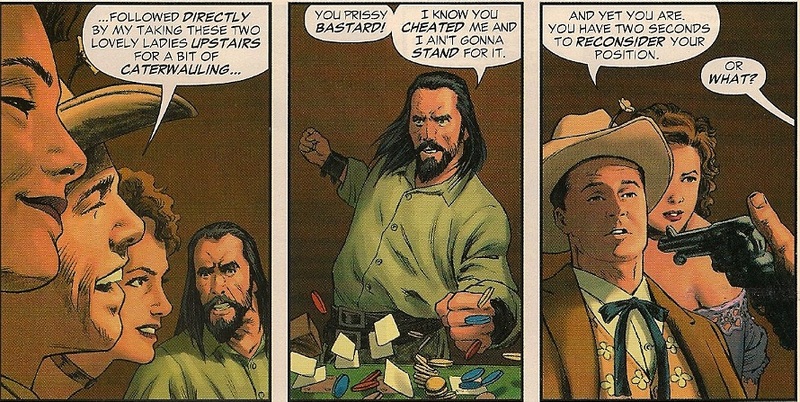 Later that night, Lash is in a poker game, women draped about him, and he is winning in every meaning of the word. One player accuses Lash of cheating and all hell breaks loose. 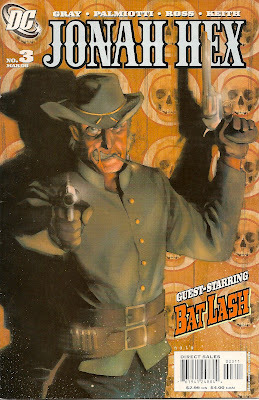 The sheriff shows up and takes Lash and the brawler to jail only to find Jonah Hex sitting in the office, guns drawn. Lash locks up the deputies and the brawler but Hex won't allow the sheriff into the cell. Lash demands that justice be served according to the law but Hex states that this point is where he and Lash will part ways. Hex escorts the sheriff outside as Bat looks on. Morning finds Hex on horseback, leading another horse carrying a bound sheriff. They come upon a group of mounted Indians and Jonah has a few words with them. The Indians ride up and jerk the sheriff off his horse. The sheriff starts screaming for Hex to save him but Jonah says that he has no control over free men and that their money is just as good as anyone elses. The Indians scalp the sheriff alive and then finish him off. Bat Lash rides up in time to see the payoff. He rides off with Jonah in one of the most classic endings in any western ever. Jonah's Injuries - Boxed up and sent over a waterfall. This is probably one of the most perfect westerns that I have ever read. Jonah is spot on, Lash is wonderfully light without being a lightweight and with this issue Gray and Palmiotti have hit their stride with this book. There are little touches that make this story great: the Indian seen in town that, we learn later, is known by Hex; Lash's sarcastic comments that his opponents don't understand; the evil kid brother who looks like Matt Dillon. Next Issue: The man who won't stop talking, a woman who can't start talking, and the plot device that won't die. This was the issue that confirmed for me J&J knew what they were doing. 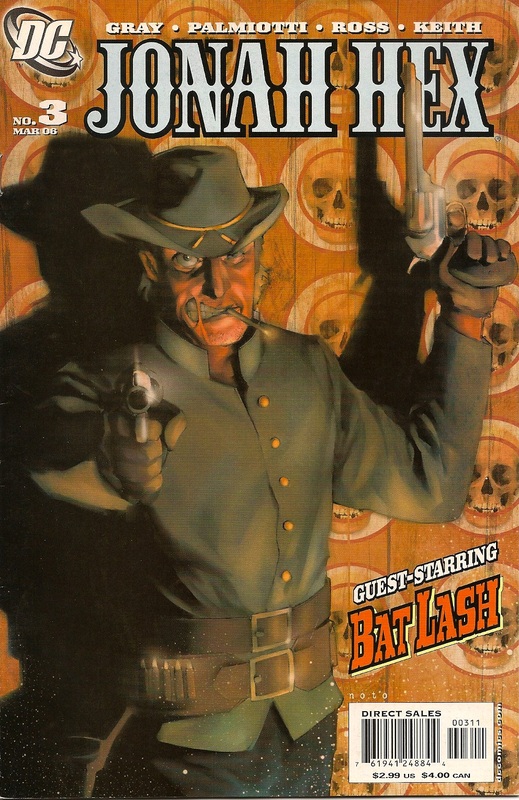 Bat Lash is my #2 fave Western guy, so I was delighted with his appearance here. 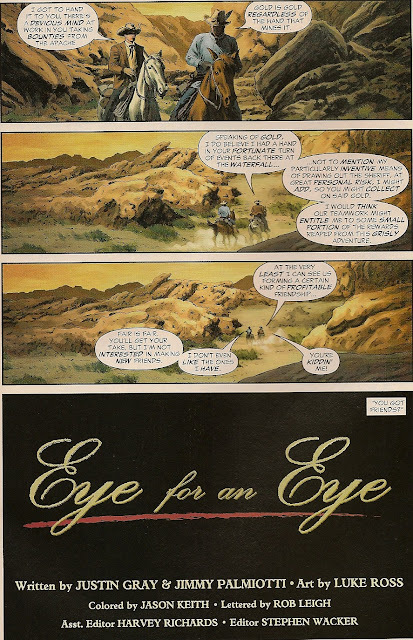 For a few years, whenever I wanted to entice someone into buying Jonah Hex ,this was the issue I gave them (it was later supplanted by the first Darwyn Cooke issue due to him being a better-known name). The Noto cover is also great, and just a precursor to what we'd be seeing from him a year later. As for cliches to keep track of, I recommend adding a "bad religion" counter for all the knocks that the Christian faith takes throughout the series. We ain't perfect, but we've gotta be better than this!